Andhyta Utami and Andrew Leach also contributed to this post. The new spike in fire alerts reaffirms the need for a more concerted and coordinated intervention by Indonesia’s national and local government agencies, companies, and regional partners to prevent future fires. Companies sourcing commodities from the region should increase scrutiny of their supply chains to ensure their buying practices are not inadvertently supporting burning. While the Indonesian government has concession maps showing which companies operate where, it does not release the most accurate information publicly. 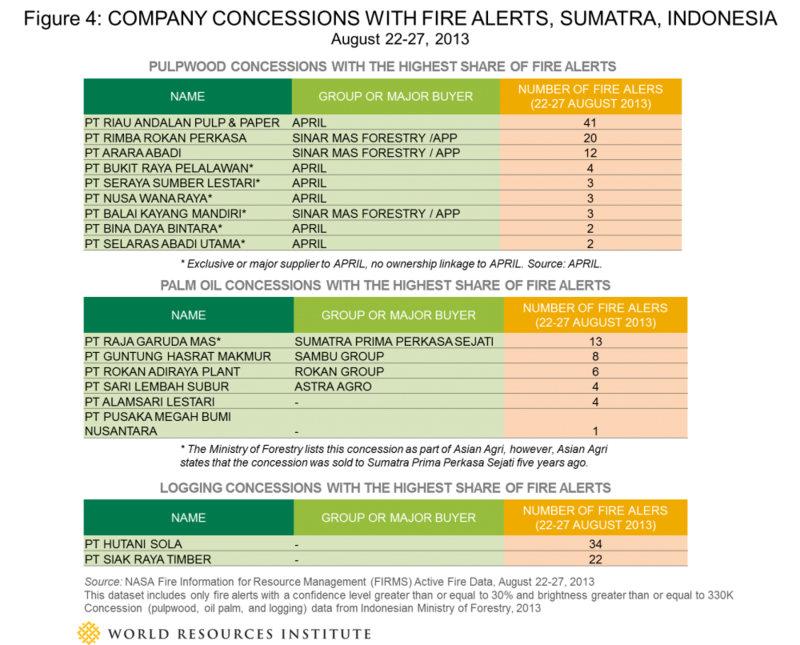 By releasing more detailed and up-to-date concession maps, the Indonesian government could significantly improve transparency and accountability for forest management, as well as enable improved efforts to quell the risk of future fires. Figure 1 shows the number of fire alerts each day in Sumatra’s provinces since June 1, 2013. While the most severe spike occurred in mid-June, activity over the last week shows a second dramatic increase in alerts. Figure 2 shows the general dispersion and southward shift of the fire alerts compared to their locations in June. While most of the fire alerts were concentrated in Riau province in June and July, the fire alerts of August 22-27 are distributed more widely. Figure 3 indicates where fire alerts were distributed by land use. 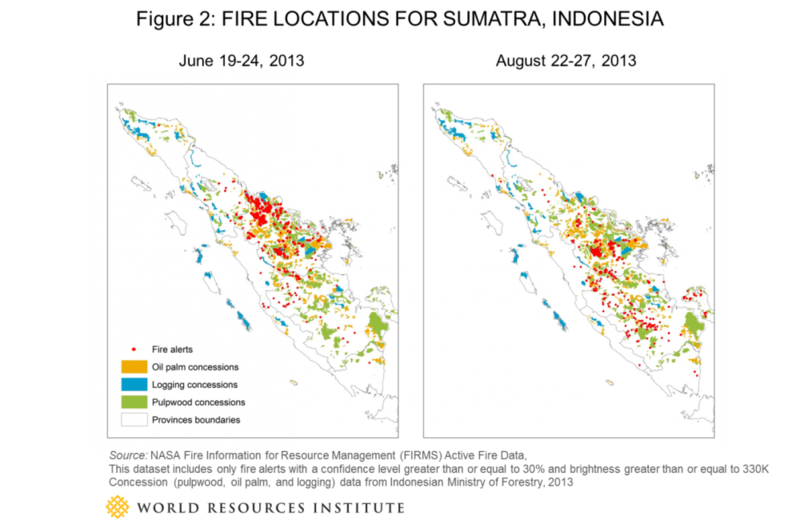 About 36 percent of the fire alerts fell in concessions managed by oil palm, logging, and pulpwood companies. While this represents a decrease in the percentage of alerts in concession land compared with previous spikes, the number of alerts on company lands remains high. A list of the affected concessions and companies is available at the end of the document. Given the historical record, we can anticipate that the risk of fires will remain high in the coming months—and in future dry seasons—unless action is taken. Western Indonesia’s dry season will continue through October. There is a significant risk that the fires could worsen, with grave implications for human health due to deteriorating air quality, chiefly for the people of Sumatra, but also for Malaysians and Singaporeans depending on wind patterns. The new spike in alerts also serves as a timely reminder of the need for a new regional fire monitoring system, which was proposed by the governments of five Southeast Asian countries (Brunei, Indonesia, Malaysia, Singapore, and Thailand) in response to the June haze crisis. A key element of the system is a proposal for governments to share data with each other on company concession boundaries, in order to “assist in monitoring and internal enforcement actions against irresponsible parties contributing to fires.” Adoption of this proposal was unfortunately postponed until Southeast Asian heads of state meet in early October at the 23rd ASEAN Summit in Brunei Darussalam. WRI has urged governments in the region to make company concession data fully transparent. Public access to this data is essential for coordination between local and national government agencies, for contract compliance between commodity producers and their customers, and for monitoring and analysis by researchers and civil society. The return of the fires underscores a clear need for urgent action from governments and companies in the region. When the heads of state of the Southeast Asian countries gather in October to discuss a raft of regional issues, fires should be high on their agenda. Seizing the opportunity for action now is the only way to prevent fires from further harming the environment, economies, and most importantly, the health and safety of people across Southeast Asia. 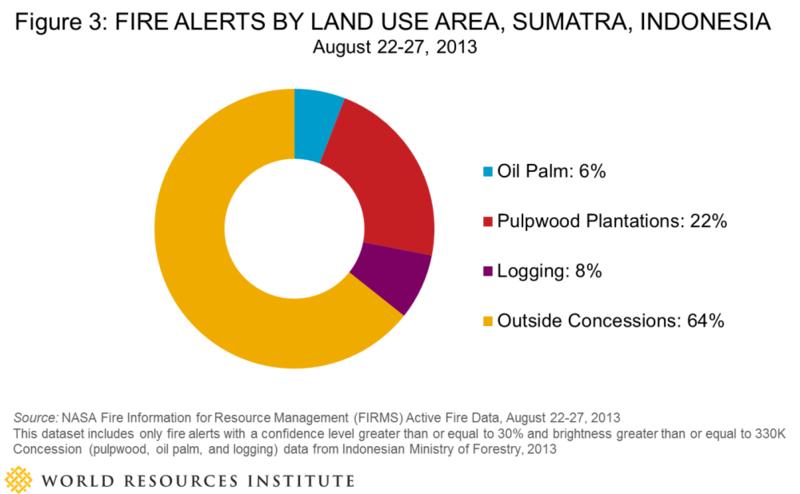 LEARN MORE: Check out WRI's full blog series on Indonesia's forest fires. We used NASA’s Active Fire Data to determine the likely location of fires on the ground. This system uses the NASA MODIS satellites that survey the entire earth every 1-2 days. The sensors on these satellites detect the heat signatures of fires within the infrared spectral band. When the satellite imagery is processed, an algorithm searches for fire-like signatures. When a fire is detected, the system indicates the 1 km2 where the fire occurred with an “alert.” The system will nearly always detect fires of 1,000 m2 in size, but under ideal conditions, can detect flaming fires as small as 50m2. Since each satellite passes over the equator twice a day, these alerts can be provided in near-real time. Fire alerts are posted on the NASA FIRMS website within 3 hours of detection by the satellite. Many papers have been published to validate the NASA MODIS active fire alerts for use in various applications. WRI is employing a recommendation for detecting forest clearing fires (described in Morton and Defries, 2008), identifying fires with a Brightness value ≥330 Kelvin and a Confidence value ≥ 30% to indicate fires that have a high confidence for being forest-clearing fires. Low confidence fires are lower intensity fires that could either be from non-forest-clearing fire activity (clearing fields or grass burning), or could be older fires that have decreased in intensity (smoldering rather than flaming fires). The use of this classification establishes a higher standard for fire detection than using all fire alerts equally.